For Lifestyle, Food, or whatever your passion is, Marjoram Pro’s sleek light design, 14 blog styled layouts, and a ton of customization options are sure to delight even the most serious blogger. Don’t let this theme fool you, it’s actually easy to get started and begin writing blog posts for your discerning readers. Marjoram Pro includes some very handy custom widgets like the thumbnail-based Recent Posts widget, an Author’s widget that lets you easily add social icons, and of course we’ve included a nicely styled Image Widget to showcase whatever you wish. Don’t like the colours? Not to worry because this theme is packed with a massive set of colour selectors to allow unlimited colour combinations by changing various page elements to help transform your site’s overall feel. Of course, it doesn’t end here with features…. there’s a lot more! 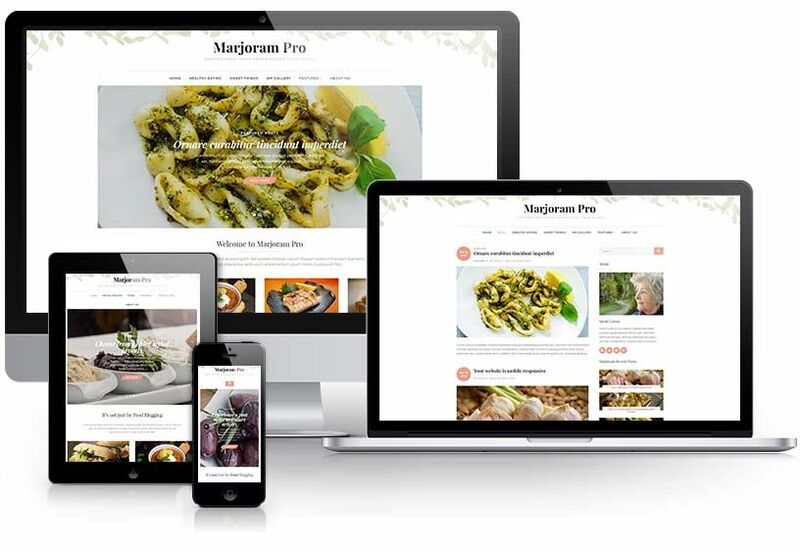 Here are several key features of the Marjoram Pro WordPress theme, but not limited to what it offers! Not only do you get 19 sidebar positions, but you also get dynamic width that self-adjusts. Thumbnail recent posts, an ImageBox widget with captions and a Read More link, and Author Info. Change your page backgrounds with a solid colour or perhaps add a beautiful photo to your pages. You get the option to add a couple more Google fonts to your site and change the headings and main text.